Baking bread is a delight. I just cannot describe the feeling when a perfect loaf comes out of the oven. When I baked basil garlic bread, I couldn’t wait for the loaf to cool down a bit. The aroma was too overwhelming and made me feel soooo hungry. Yes, arm muscles were at work again but its worth the effort. 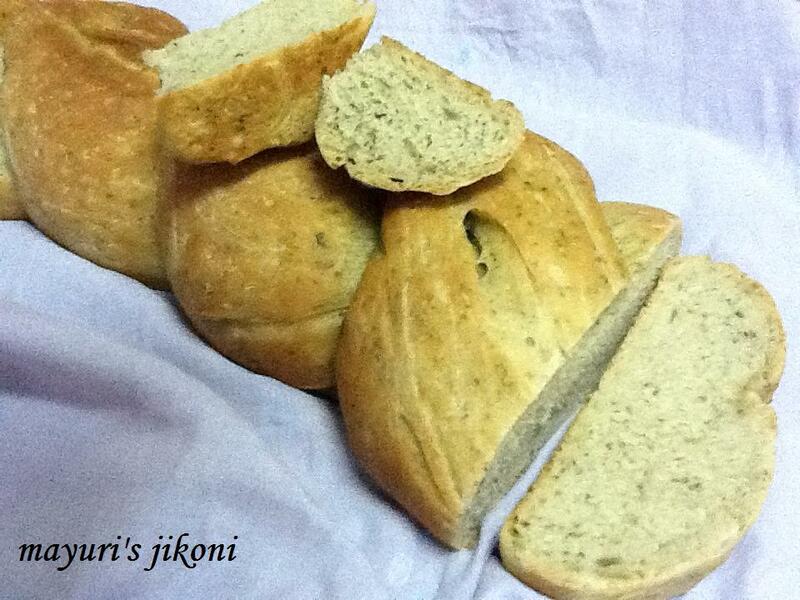 So, how many of you have tried baking bread at home? Sieve flour, sugar and salt together into a big bowl. Add the minced garlic and herbs and mix into the flour. Add the lukewarm water and form a dough. Knead the dough with the heel of your palm for 10 minutes till it is smooth and silky. If it is too sticky add a bit of flour. Form the dough into a big ball. Rub oil all over the bowl and the dough. Place the dough in the bowl and cover with a cling film. Keep the dough in a warm place for nearly 2 hours or till its double the size. Knock the dough down gently with your knuckles. Rest the dough for 10 minutes covered. Shape the dough into a loaf or plait it or make into small buns. Place the shaped dough into a loaf tin or a baking tray. Let the dough rise again till its double the size. This will take about 1 hour. Place the risen dough in the oven and bake for 20 to 25 minutes or till the top is golden brown. Remove the bread from the tray or tin and let it cool on a wire rack. Brush the top of the shaped dough with butter, oil or egg wash.
Use rosemary, parsley, or any herb of your choice instead of basil. Can use a combination of herbs. Knead the dough on a kitchen work top or a board. If your worktop is made of granite or marble then do not knead the dough on it as it tends to be cold. For kneading technique check out my rosemary sunflower seed bread recipe. Smalls buns will take only 15 to 20 minutes to bake.